How to interpret the recent unrest on the streets of Istanbul and about 65 other Turkish cities? Specifically, is it comparable to the Arab uprisings over the last 2½ years in Tunisia, Libya, Egypt, Syria, Yemen and Bahrain? 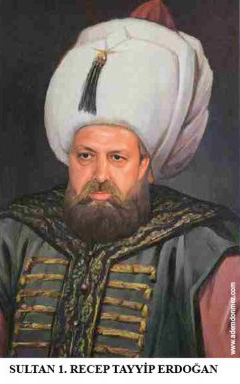 Turks have fun picturing Prime Minister Erdoğan as an Ottoman ruler. On one level, they appear unrelated, for Turkey is a far more advanced country, with a democratic culture and a modern economy. But two connections — autocracy and Syria — do tie them together, suggesting that the Turkish demonstrations could have a potentially deep importance. The rebellion did not come out of nowhere. I was in Istanbul last fall, and it was clear then that Prime Minister Recep Tayyip Erdoğan's dictatorial tendencies worried Turks more than his Islamic aspirations. I heard unceasing criticisms about his being "intoxicated with power," an "informal caliph" and "Turkey's elected chief social engineer." Turks enumerated to me a lengthy list of authoritarian symptoms they suffered from the decade-long rule by Erdoğan's Justice and Development Party, or AKP: suppression of political criticism, crony capitalism, manipulation of the judiciary, unjust imprisonment, show trials and a disregard for the separation of powers. In particular, they evinced annoyance at the way Erdoğan seeks to impose his personal tastes on the country. The demonstrations since Friday are protesting these actions and more. What began as a localized dispute over the uprooting of a small park at Taksim Square in the heart of modern Istanbul has rapidly grown into a national statement of defiance. 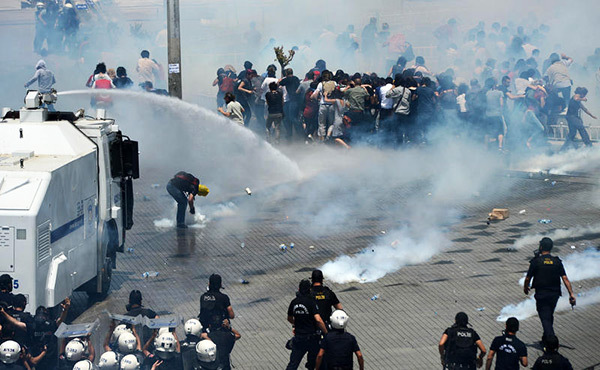 Erdoğan is no Moammar Kadafi or Bashar Assad, and he will not massacre peaceful demonstrators, but heavy-handed police operations have reportedly led to 2,300 injured and, according to Amnesty International, two deaths. Further, the prime minister has reacted defiantly, not just insisting on his original plan for the park but announcing he can do whatever he pleases. 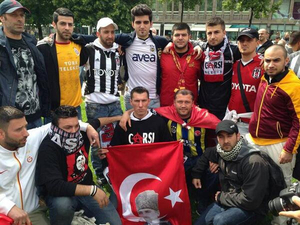 Rival die-hard football fans do the unthinkable and join forces against Erdoğan. As paraphrased by Hürriyet Daily News: "A mosque will be built in Taksim, Erdoğan said. He added that he did not have to take permission from the main opposition leader or a 'few marauders' for the projects, noting that the authority had already been given by people who voted for the AKP." Erdoğan is saying, in other words, that having voted the AKP into office, Turks have given him authority to do anything he wants. He is the elected, unaccountable padishah. Well, the demonstrators and those hitherto eager foreign investors have something to say about that, perhaps putting the country's China-like economic growth at risk. Significantly, Abdullah Gül, the president of Turkey and increasingly Erdoğan's rival, adopted a very different approach to the protests. "Democracy does not only mean elections," he said. "The messages delivered with good intentions have been received." By distancing himself from the prime minister, Gül exacerbated Erdoğan's isolation. As for Syria, after a charmed near-decade in power, Erdoğan made his first major miscalculation by intensely involving Turkey in the Syrian civil war. He acted with pique when Assad, the Syrian despot and a onetime buddy, ignored his (sound) advice to make reforms. Not one to take well to being rebuffed, Erdoğan responded emotionally and thrust his country into the civil war, hosting the rebels, provisioning and arming them and trying to guide them. The results have been close to disastrous from Turkey's viewpoint. The country has experienced new hostilities with Moscow, Tehran and Baghdad, lost both overland trade routes to the Persian Gulf and trade with Syria, suffered terrorism on Turkish soil (in Reyhanli) and — perhaps most ominous — witnessed tensions surge between its stridently Sunni government and the country's heterodox Muslim populations. Thanks to the Syrian imbroglio, Turkey has lost its enviable position of strength and popularity — its "zero problems with neighbors" policy that brought with it real accomplishments — in favor of a sense of being surrounded by foes. If President Obama once bragged of his "close working relationship" with Erdoğan, last month's White House meeting between the two showed neither the personal chemistry nor the practical results vis-à-vis Syria that Erdoğan had sought. In short, it appears that a decade of electoral calm, political stability and plentiful foreign investment has come to a halt and a new, more difficult era has begun for the AKP government. The moribund opposition parties may find their voice. The antiwar faction may feel emboldened. The secularists may be able to tap the wide unhappiness with the regime's efforts to corral citizens into becoming more (Islamically) virtuous. This is excellent news. Turkey has been heading in the wrong direction under the AKP. Although a democracy, the AKP government has jailed more journalists than any other state in the world. Although secular, it has with growing urgency imposed arrays of Islamist regulations, including last week's rushed limitation on alcohol as well as warnings against public displays of affection. Although a member of the North Atlantic Treaty Organization, Turkey engaged in 2010 in a joint air exercise with China. Although an applicant to the European Union, it plays footsie with the Shanghai Cooperation Organisation, founded in 1996 by Russian and Chinese leaders as an anti-NATO grouping. Although supposedly an American ally, Turkey has humiliated Israel, called Zionism a "crime against humanity," and acclaimed the terror-listed Hamas organization. Erdoğan's police showing the peaceful protesters who's boss. Thanks to the demonstrations, we can be newly hopeful that Turkey may avoid the path it had been on, that of despotism, Islamification and increasingly rogue foreign relations. Perhaps its secular, democratic and pro-Western heritage can be revived. Daniel Pipes is president of the Middle East Forum and a columnist for National Review. June 4, 2013 update: For a perceptive analysis of the two choices facing the prime minister now - learn from the protests or double down in his authoritarian ways - see Kemal Kirişci, "How Erdoğan Fell From Grace."